We organised a unique culinary dining in the dark experience at The Deck Coffee House in Cardiff, The event was aimed to enhance people’s senses and for diners to get a feel, for the challenges that blind and partially sighted people face on a daily basis. Upon arrival guests were blindfolded and guided to their seats, to enjoy a 3 course meal, of which they didn’t know what they would be eating. 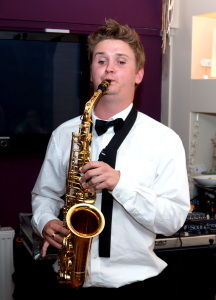 Diners at the event enjoyed entertainment from Guernsey-based blind musician, Breton Smeed, who played the saxophone and guitar. 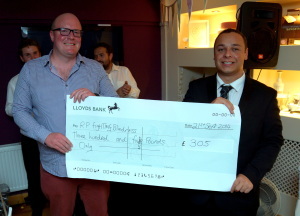 All proceeds from ticket sales for the dinner were donated to RP Fighting Blindness, a charity working to support individuals like Daniel who suffer from retinitis pigmentosa. Visualise Training and Consultancy were honored to have Specsavers on board to sponsor the event. James Deavall, director of Specsavers in Cardiff, said: ‘Specsavers were very pleased to sponsor Daniel’s event; we were struck by his innovative and unusual event concept. ‘Daniel’s inspiring story and positive attitude makes him a real role model, and the advice and guidance his business can offer to organisations will make a real difference to customers who are visually impaired.